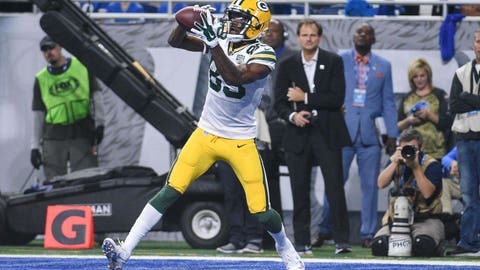 The Green Bay Packers‘ offense looked a bit different Sunday in a 31-23 loss to the Detroit Lions. In the absence of Randall Cobb and Geronimo Allison, quarterback Aaron Rodgers turned to Jimmy Graham and Marquez Valdes-Scantling. Graham ranked second on the team with 11 targets, while Valdes-Scantling had 10. As usual, Davante Adams led the way with 12 targets. It’s a career high for Valdes-Scantling, who was on the field for 95 percent of the Packers’ plays on offense, up from 71 percent last week, which Cobb also missed. The rookie had previously struggled to get on the field, playing on just two, six and 12 snaps on offense in the Packers’ first three games. He responded with a solid stat line, finishing with seven catches for 68 yards and a touchdown. Valdes-Scantling didn’t have any issues getting open, averaging 4.6 yards of separation from the nearest defender on his seven catches per Next Gen Stats, tied for fifth in the league last week. Fellow rookie Equanimeous St. Brown also saw a major uptick in playing time, appearing on 74 percent of the Packers’ plays on offense. He finished with three receptions for 89 yards on five targets. — Undrafted rookie tight end Robert Tonyan was on the field for three plays, his first snaps on offense. — The loss of Cobb and Allison didn’t mean any extra work for the Packers’ other tight ends. Lance Kendricks saw just 18 offense snaps, down from 35 in Week 4, while Marcedes Lewis was on the field for 12, down from 17 the previous week. — Jamaal Williams led the Packers’ three-headed backfield with 33 snaps, out-snapping Ty Montgomery (29) and Aaron Jones (22). — Jones was the Packers’ most productive back despite his usage, picking up a team-high 40 yards on seven carries. Williams gained 33 yards on six carries, while Montgomery had 15 yards on four carries. — Linebacker Blake Martinez and safety Ha Ha Clinton-Dix are now the only members of the Packers’ defense to have played on 100 percent of the team’s defensive snaps through five games.